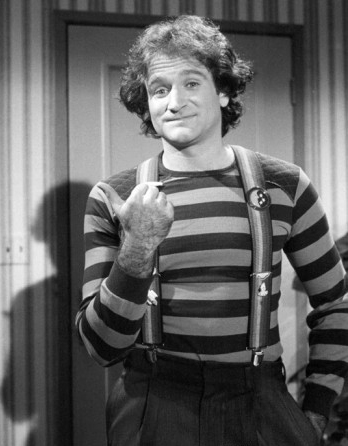 RIP Robin Williams « You know… that Blog? I have no words, except, perhaps “Shazbot“. Suicide is never the right way out, and today we lost a truly great man. Suicide may not be the best option, but as someone who lives with mental illness, I can’t condemn someone else’s despair. I have many episodes of suicide ideation during any given year. Ideation is, of course, different from actual planning. If I went to the E.R. every time I had a suicidal thought, I’d have to live there. I didn’t know that Robin was going through such a struggle. It seems that it is often true that those who are smiling on the outside are crying on the inside. Sorry you’re dealing with such rough thoughts. I am sure you’re getting help with yours, and you know yourself enough to realize that you shouldn’t listen or follow through with those urges. Of course you realize I’m not condemning him for his actions, just making a comment that it wasn’t the right thing to do. We don’t know what was going on in Robin’s head, and it breaks my heart that it came to this. We don’t talk about mental illnesses enough in our society, and as a result, we lose many people who can’t see any other way out of the pain of being. Maybe one good thing can come of this, and we can finally start talking about it. If the great Robin Williams could take his own life, it could happen to anyone. *hugs* to you. I’ve got an ache in my heart today. Robin Williams gave us so much. Trying to get back on the blogging train, and I knew just where to stop first. Thanks for this! but I had a strong reaction. I’m so sad about this one. What a beautiful soul.